Once payment is made, please check your email for download directions. Check your Spam box as well. NEW CLICK HERE TO READ FEEDBACK FROM OTHER TEACHERS!!!!! For the teacher to give away for positive reinforcement! Get students excited with these back to school activities! Print all of these pages and bind to make a book. Great writing project to work on the first week of school! These will be fun to look at in June! Class Rules signs to display and behavior plans to put on a student's desk! Form letters and Birthday notes from the teacher. A birthday bulletin board set is included. Print, cut, & disolay! Ready to use calendars for all your classroom needs! Print & Cut calendar numbers & calendar tags for your class calendar. Print & Cut Center signs! Center activity sheets for you to use in your centers. All the forms you need to make parent conferences a breeze! Print, Cut, Type/Write student name, & place on desk! Permission forms ready to use & something for your students to do after the trip! Various quick tests. Student evaluations. Get homework rolling in the right direction with these goodies! Print, cut, type/write student name, & display! Print, cut, & display in your classroom! Lots of goodies to make your parent night a hit! A few treats to help you get your student's portfolios in order. Print each page and pind into a book for each student. Have the student's complete these during SSR or quiet choice! Make the students in your class want to read at home. You may use these slips in any form. They are great to send home for monthly reading homework! Get your students reading the room with these room tags. Print, cut, and place the tags on the stated object and watch your class learn to read the room! Some special forms to help your student feel special during their special week! Just a few review activities to start the year or to use when needed! Your class is special. Make them feel welcome by printing, cutting,laminating, and displaying these great signs! Use string ortape to hand these cute tags on your students. You forget things and so do your students and their parents. Help them remember with these great forms. 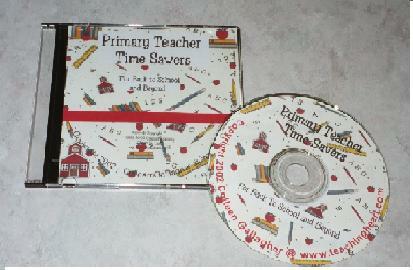 You buy the supplies and print the kits to make great treats for your students and their parents. A few forms and goodies that every teacher needs! These are covers for Journals. The students color the covers. Help organize your class with these helpers! Print, Cut, Laminate, & Display. Use to show students order of daily events. You may choose to display in a pocket chart or you may attach magnets to the back of signs and place on a magnetic board. VISIT OUR STORE - Click Here!!! A Picture of Some of The Many Things Found on the CD!